RC13 Process Servers Canadian Process Serving Inc. 142 Catharine St. S. Hamilton, ON L8N 2J8 Tel: 800-465-7378 Email: serve@canadianprocessserving.com Website: www.canadianprocessserving.com Celebrating 30 years in business, Canadian Process Serving Inc. is North America's largest process serving company with offices across Canada. As a professional association of retired peace officers, we are proud to include the nation's top law firms amongst our clients. PROCESS SERVING | ISSUING & FILING | DOCUMENT RETRIEVAL & LITIGATION SEARCHES Dye & Durham Corporation Exchange Tower 130 King Street West, Suite 501 P.O. Box 445 Toronto, ON M5X 1E4 Tel: 800-661-1811 Email: info@dyedurham.com Website: www.dyedurham.com Count on Dye & Durham to serve court documents efficiently and professionally. Submit and manage your requests using our etray data solution and online work order system. Dye & Durham has been conducting process serving for over 30 years across Canada, the United States and internationally through a proven and screened network of agents. 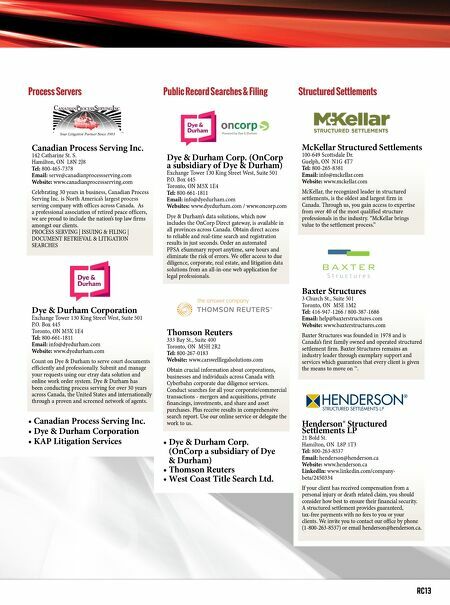 • Canadian Process Serving Inc. • Dye & Durham Corporation • KAP Litigation Services Public Record Searches & Filing Dye & Durham Corp. (OnCorp a subsidiary of Dye & Durham) Exchange Tower 130 King Street West, Suite 501 P.O. Box 445 Toronto, ON M5X 1E4 Tel: 800-661-1811 Email: info@dyedurham.com Websites: www.dyedurham.com / www.oncorp.com Dye & Durham's data solutions, which now includes the OnCorp Direct gateway, is available in all provinces across Canada. Obtain direct access to reliable and real-time search and registration results in just seconds. Order an automated PPSA eSummary report anytime, save hours and eliminate the risk of errors. We offer access to due diligence, corporate, real estate, and litigation data solutions from an all-in-one web application for legal professionals. Thomson Reuters 333 Bay St., Suite 400 Toronto, ON M5H 2R2 Tel: 800-267-0183 Website: www.carswelllegalsolutions.com Obtain crucial information about corporations, businesses and individuals across Canada with Cyberbahn corporate due diligence services. Conduct searches for all your corporate/commercial transactions - mergers and acquisitions, private financings, investments, and share and asset purchases. Plus receive results in comprehensive search report. Use our online service or delegate the work to us. 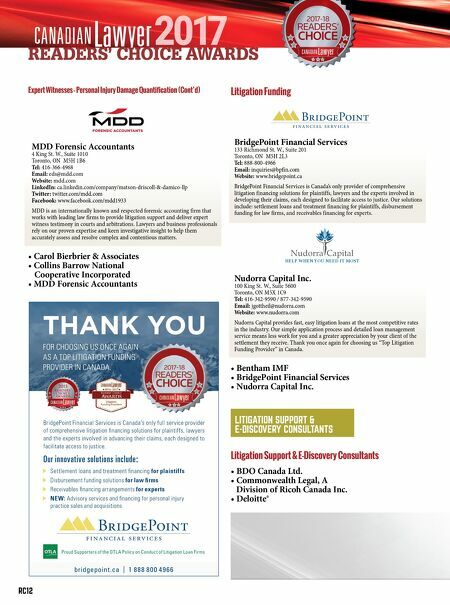 • Dye & Durham Corp. (OnCorp a subsidiary of Dye & Durham) • Thomson Reuters • West Coast Title Search Ltd. Structured Settlements McKellar Structured Settlements 100-649 Scottsdale Dr. Guelph, ON N1G 4T7 Tel: 800-265-8381 Email: info@mckellar.com Website: www.mckellar.com McKellar, the recognized leader in structured settlements, is the oldest and largest firm in Canada. Through us, you gain access to expertise from over 40 of the most qualified structure professionals in the industry. "McKellar brings value to the settlement process." Baxter Structures 3 Church St., Suite 501 Toronto, ON M5E 1M2 Tel: 416-947-1266 / 800-387-1686 Email: help@baxterstructures.com Website: www.baxterstructures.com Baxter Structures was founded in 1978 and is Canada's first family owned and operated structured settlement firm. Baxter Structures remains an industry leader through exemplary support and services which guarantees that every client is given the means to move on ™. Henderson® Structured Settlements LP 21 Bold St. Hamilton, ON L8P 1T3 Tel: 800-263-8537 Email: henderson@henderson.ca Website: www.henderson.ca LinkedIn: www.linkedin.com/company- beta/2450334 If your client has received compensation from a personal injury or death related claim, you should consider how best to ensure their financial security. A structured settlement provides guaranteed, tax-free payments with no fees to you or your clients. We invite you to contact our office by phone (1-800-263-8537) or email henderson@henderson.ca.